Ngapouri Highlands began showing cattle in 2006. We have concentrated on our local Rotorua A&P Show and the Winter Virtual Show. Fionn of Ngapouri (Fiona) place 3rd. This was Fiona's first outing. She had been weaned and haltered trained for only 2 weeks prior to the show. Doilidh of Trossachs (Dolly) placed first. Sileas of Trossachs (Julia) placed second. 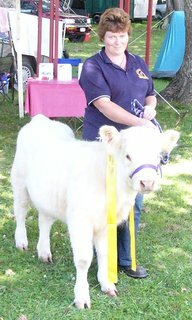 Dolly was Reserve Champion Yearling. 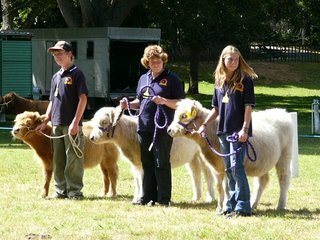 In 2008 at Rotorua A&P we acheived a measure of success. We showed five animals and 4 of them ribboned. First and second were Julia and Dolly. Julia went on to receive "Reserve Champion Calf". Percy Montgomery won 2nd place. Ainslie McKenzie won 2nd place. While we are proud of our own animals and their success in the show ring, we want to acknowledge the other competitors, especially the new breeders in the ring. Frandi, Kintyre, Daval and Shaleo are to be congratulated for their efforts.